I love salads and soups very much for our weekday's dinner. Especially if a salad is prepared with couple of beans in it, i can have it without any fuss. Obviously you can guess that i will always make salads withbeans in it. I dont grab a 1 kg packet of beans from stores, i usually take 5 kgs bags for my monthly use. They are cheaper than a kg pack and needless to say, if i dont eat meats or seafoods, i can get sufficient proteins from these beans. My store room will always have kidney beans, black-eyed peas, chickpeas and the black beans. I just love to cook with these legumes. No time to soak beans, dont worry, make a huge bags of soaked beans during weekend and store them in freezer, they are just handy to dish out anything with them. 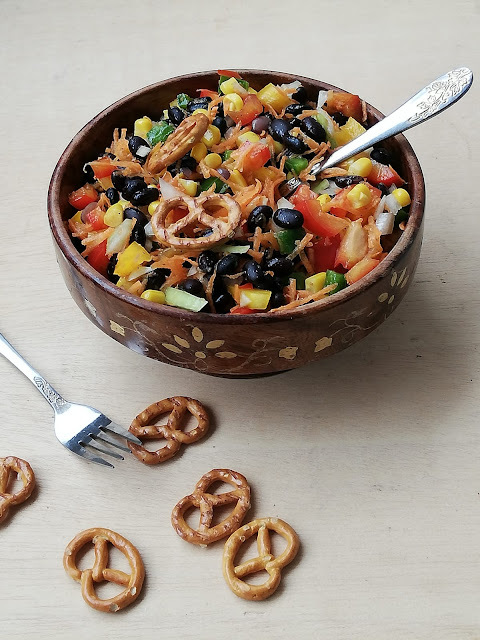 Coming to my today's post, its a vegan and gluten free friendly salad prepared with couple of vegetables and black beans. One can have this salad in a wrap or else simply with some grilled meats for their meal. 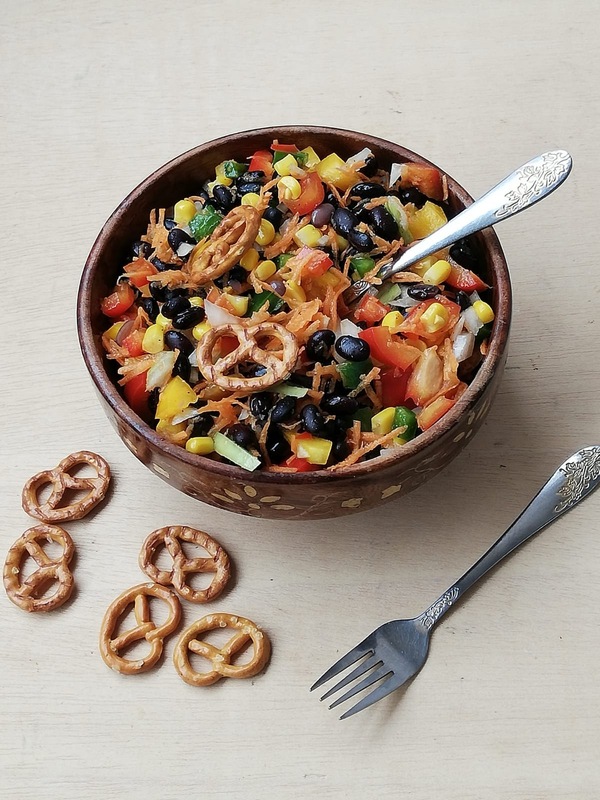 Loaded with proteins, you can enjoy this salad with a simple, quick and easy apple cider vinegar dressing which is obviously vegan as well. A prefect salad to carry in a lunch box with the dressing in a separate box. 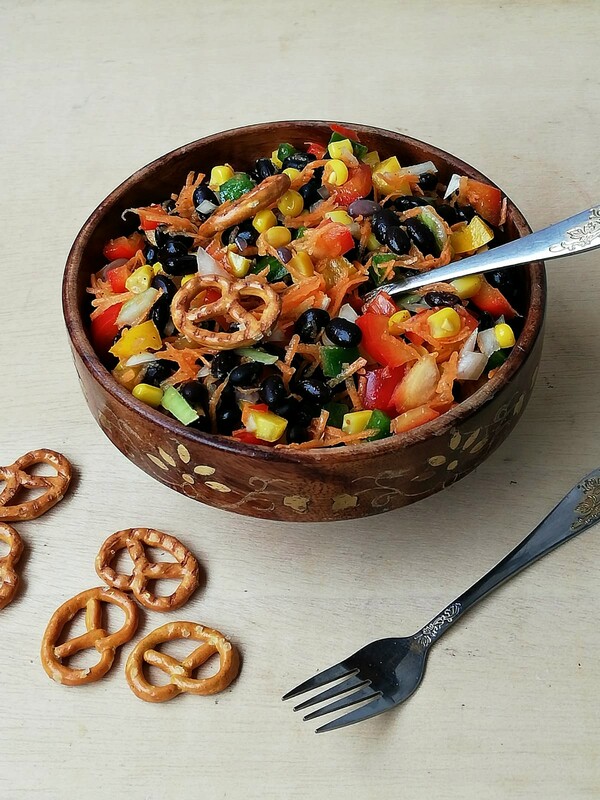 Just mix the dressing before having this salad and your lunch is ready to enjoy. If you dont have black beans, try with your beans, am sure you will love it. Take the apple cide vinegar, olive oil, salt and pepper powder in a bowl, whisk and keep aside. 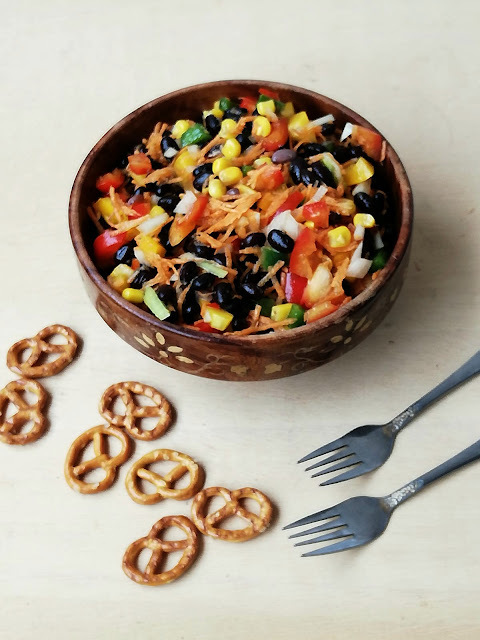 In a bowl, take the cooked black beans,grated carrot, chopped tomatoes, chopped white onions, chopped green, red and yellow bellpeppers, corn kernels. Mix the vegetables and beans well. While serving add the vinegar dressing as per need. If you want to add dijon mustard in the dressing, dont forget to add half a teaspoon of dijon mustard and whisk.